a. Lithium chloride (LiCl) solutions are freshly made by dissolving LiCl in 0.9% saline. b. 5 h before behavioral tests begin, mice are weighed and then given i.p. injections of either saline, 200, 300, or 400 mg/kg LiCl in an injection volume of 4 mL/kg body weight. c. Mice are also given, in addition to their existing water bottle, a 0.9% saline bottle to reduce possible ion imbalances caused by lithium. Lithium tends to have a mood stabilizing, antidepressant effect in certain individuals with depression and/or bipolar disorder. To test this phenomena in mice and explore possible genetic basis of differential sensitivity, FST is used in 11 diverse strains in combination with different doses of lithium. 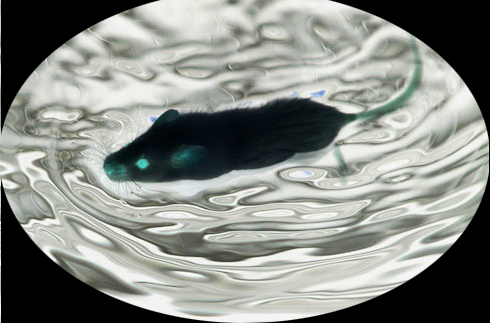 Water exposure is one of the most anxiety provoking stimuli for mice. When treated, lithium-sensitive and anxious mice will likely continue to struggle and swim to escape, consequently showing less "behavioral despair" or immobility. a. 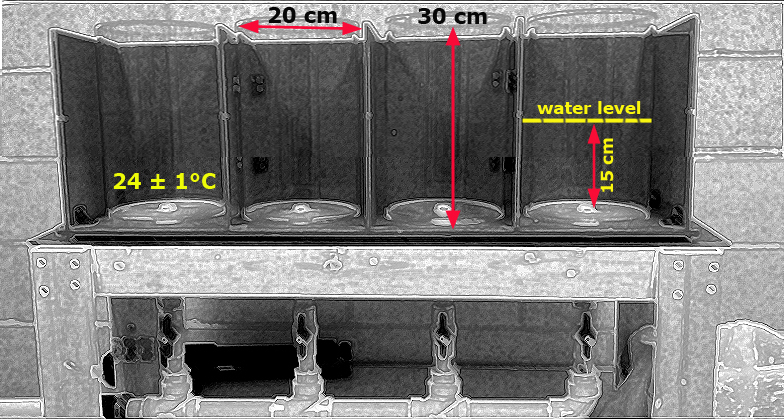 The FST is conducted using Plexiglas cylinders filled with 15 cm of tap water maintained between 23 - 25°C temperature. b. After 5 h of lithium administration, mice are tested and videotaped during a 6-min FST session. All mice within each strain are represented in each group tested and their order are counterbalanced and/or randomized. c. Video recordings are subsequently analyzed for activity during FST. d. The last 4 min of each session are scored for mobility/immobility by a trained observer who is blinded to the group assignments. Mobility is defined as any movement beyond what is necessary to maintain the head above water. e. At the end of the trial session, mice are taken out of the water, dried with a paper towel and placed back in their home cages. a. Following behavioral tests, mice are anesthetized using isoflurane. b. Once mice are fully anesthetized, intra-cardiac blood is collected using 16G needle and 5 mL syringe. c. Following cardiac exanguination, brains are dissected, weighed, and frozen at -80°C for later analysis. d. Fully thawed brains are homogenized using a polytron in three volumes of 0.5 N trichloroacetic acid for denaturation. e. Brain samples are then centrifuged and the supernatant is evaluated for lithium levels (mmol/kg, wet weight) using a digital flame photometer. f. Blood samples are allowed to clot at room temperature for at least 30 min, and then centrifuged to collect serum samples. g. Serum lithium levels (mmol/L) are determined using the same digital flame photometer above. Figure 1. Schematic illustration of an FST setup. Figure 2. Videotaped image of a mouse during FST. Gould TD, Dao DT, Kovacsics CE. The open field test. In: Mood and Anxiety Related Phenotypes in Mice: characterization using behavioral tests (book), Gould TD editor, Humana Press, pp 1-20. (2009). Shim SS, Gould TD. Neuroprotective and neurotrophic actions of lithium: implications for the treatment of bipolar disorder, Alzheimer's disease and neurodegenerative disorders. (in press). In: Metals and Neurodegeneration (book), Huang S editor, Research Signpost, Kerala, India.